Luxurious Villa and Garden, 5 Bdr + 5 Bth + Jacuzzi fully renovated Spring 2016.
benefitting from breathtaking views of its countryside, exquisite italian historical gardens and cooler temperatures. Such is "La Magione degli Alighieri", a place of inspiration for the poet Dante Alighieri and, following his exile, home to the family of Beatrice Portinari, the woman he followed to hell and beyond in his master work, The Divine Comedy. ten-minutes drive from the city cathidral, and tucked behind tall stone walls with a remote-controlled gate. World War II left the palazzo and its extensive gardens in ruin; their rescue and restoration by Count Pier Francesco Rimbotti remains one the most notable stories in the city annals. It has remained in the Rimbotti family ever since and constantly updated. The villa has been fully restored in Summer 2016 and just available for rent. 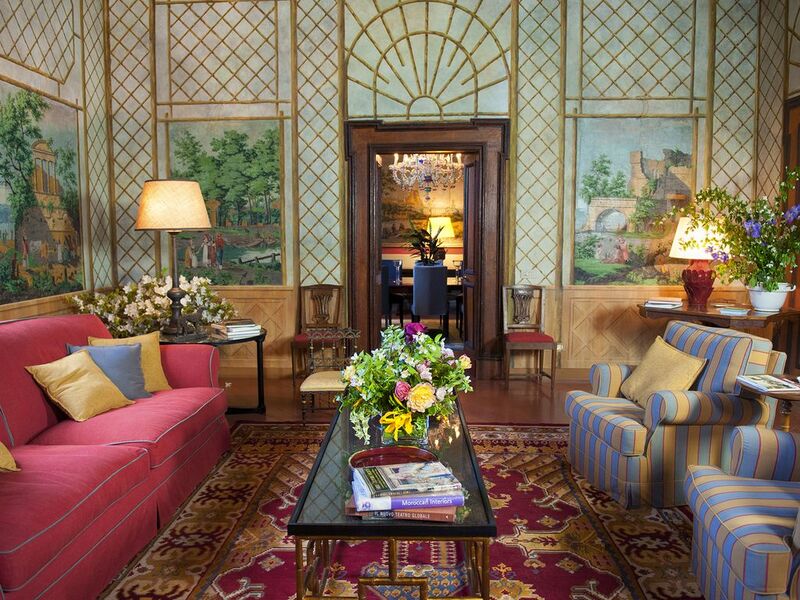 The Villa appears in many books on most beautiful villas surrounding Florence. On the ground floor, comfortably elegant sitting rooms decorated with antiques and hand-painted wall murals lie on either side of the entrance hall. Double doors from one of these lead to a panelled dining room, as suitable for six as it is for fourteen. Al fresco meals can be served in the covered verandah room or at a long table in the courtyard. The large modern kitchen is set at the rear of the house. occupied by a small but bright office which opens to a terrace with loungers for sunbathing. In the terrace there is a hot tub (hydromassage) for 6.
seat fourteen), breakfast room (with bar seating for six). Modern kitchen with top-of- the-line appliances. Laundry room and staff quarters with a separate entrance. - One hectare garden with "Italian Style Garden" and large covered Gazebo. - New swimming pool in the garden. The laundry room and the staff quarters (independent) are at the ground floor of the villa. all bedrooms have ensuite bathrooms and are fitted with independent AC. Fantastic home! We loved it! We arrived one late evening in this splendid house, in Florence, with my wife and my children. The house manager was there to receive us in a very friendly and efficient way. As the house is quite large, her instructions were very helpful. Dante's house is a totally independent aisle of an historical Florence Villa. It has it's own, italian style garden and parking space. We found the house even better than what we expected from the description on internet. Everything was working as it should be. The house has been recently completely renovated, the 5 rooms are all large and comfortable with a lovely view over Florence hills and ancient villas. In every room the air- conditioning is independent. All rooms have bathrooms ensuite. The bathrooms are beautiful with shower and/or tubes with hydromassage. The furniture are not Ikea style, they are elegant family furnitures and paintings. Plenty of wardrobes are available as well as storage spaces. Bedding and towels are of excellent quality. Thanks to the very comfortable mattresses we could completely relax after hours of visiting and shopping in Florence. The kitchen is fully equipped and very spacious, there is everything you need for up to 14 guests at table. At our arrival all beds were made and floors were perfectly waxed and polished. Something you really appreciate when you arrive late at night! Even if town center is not far (Duomo is approximately at 20 minutes drive) we were happy to have a rented car. We parked it very easily at the central train station parking and from there you can walk everywhere you need for cultural visits and shopping. You have certainly understood that we all loved this place, we found it absolutely worth it's prize and we will certainly go back, let's hope next year! Much Nicer than Pic's - Perfect for 10! Wasn't sure what we were getting when I booked (only one review at the time), but it sounded perfect for our family celebration. There were 10 of us and we wanted to be convenient to downtown Florence, yet having lots of room. I emailed Cristiana (property manager) before we booked and she said I could call. The call gave me comfort that the villa was what we were looking for. We booked it for 7 nights. The place turned out to be spectacular! Beautifully maintained and decorated. Gated for security with immaculate grounds (has to be several acres). Had linens changed and clean towels throughout the week, along with cleaning service daily. Found a great little pizza place you could walk to. Great house wine and a fun and friendly staff. We actually went 3 times (after exhausting daily touristy stuff)!!! Loved it and I would't hesitate to book again when we return to Florence. Exceptional! Villa is better than online description! We hosted a family reunion at the villa, with three couples (two grandparent aged; one middle aged) and a 20 and 13 year old. The house is comfortable, elegant, meticulously maintained, and beautifully curated. The grounds are immaculate - your own private park. Complete with a gorgeous Lebanese cedar, lemon trees and a small pool. The master suite has a patio with a hot tub. The manager of the property, Cristiana, is very welcoming, helpful and charming. As is the owner of the property who lives nearby and stopped by for a lovely visit. They were instrumental in setting up some of our day trips including an incredible visit to the Villa Antinori vineyard. You are very well taken care of at this Villa! We did not rent a car because the roads are tricky near Florence, so we used the local "7" bus stop for runs to Florence. The bus was on schedule and runs frequently. The charming little cross-road village of San Domenico is about a 10 minute walk. The village has two restaurants and a little grocer/ coffee stand - so essentials are easily accessible. If I could give 6 stars I would. Des les premiers instants vous vous sentez à la maison dans cette villa historique récemment parfaitement rénovée aux pieds de la colline de Fiesole, a quelques minutes en voiture du centre-ville. Les chambres sont spacieuses, offrent une vue superbe, ont toutes une parfaite climatisation, chacune a son propre dressing. Les salles de bain sont magnifiques. Le salon, la bibliothèque et la salle à manger dont les murs sont décorés avec des somptueuses fresques, sont un lieu idéal pour se retrouver dans une ambiance élégante et chaleureuse. Internet marche parfaitement à travers toute la maison. Le domestique nous a accueilli à notre arrivée à minuit, malgré les deux heures de retard de notre avion, avec un lumineux sourire qui ne l'a pas quitté du séjour. Il a été à notre disposition discret et efficace. Coûte que coûte ne manquez pas cette endroit, vous y trouverez le luxe d'un grand hôtel toute en vous sentant chez vous, à la maison. do not hesitate to contact us for information without engagements. the villa is fully renewed and this first year we are very flexible.